+ NEW + WEAR UNDER YOUR OWN SWIMSUIT! POO:L Protection Pants you can wear underneath your own choice of swimwear. 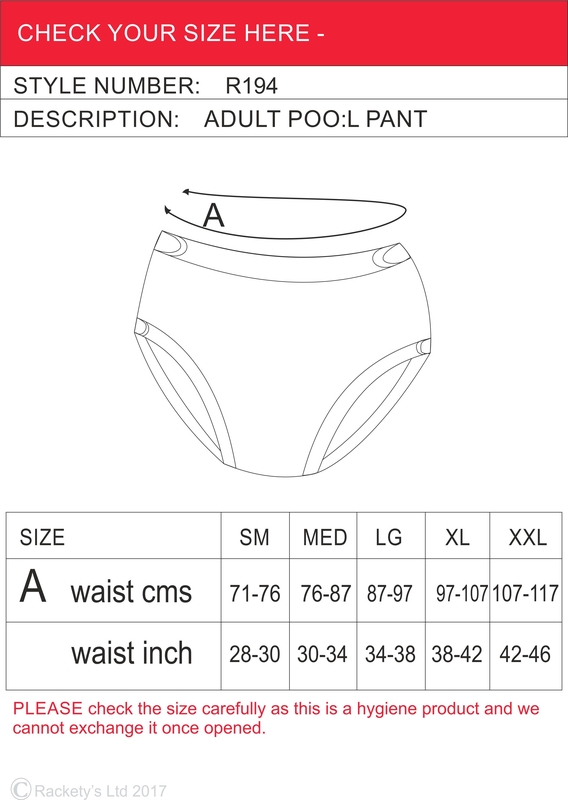 Rackety’s POO:L Protection Pants are made from a unique waterproof fabric to protect you or the person you care for from the problem of having an accident in the swimming pool. hydrotherapy pool or in the sea. They are made from a material that is soft to touch, will not make loud embarrassing rustling noises, is a bit stretchy for comfort and has a polyester base with a waterproof polyurethane coating on the inside to keep any accidents out of the pool. We have added onto the waist and leg adjustable Velcro openings which allow for an even closer fit. In addition there is soft knitted elastic around the legs and waist, with silicone gripper strips to provide grip and comfort when worn next to the skin. Award winning Rackety’s have listened to our customers comments and we think it’s the best on the market. Polyester polyurethane backed stretchy knit fabric. Silicone grip strips around the waist and legs. Adjustable Velcro closures for additional security. Note that some surface wrinkling may occur. To keep accidents out of swimming pools. To enableyou or the person you care for to relax enjoy hydrotherapy or swimming without the worry of an accident. Especially good for people with incontinence difficulties and unreliable or irregular poo habits.